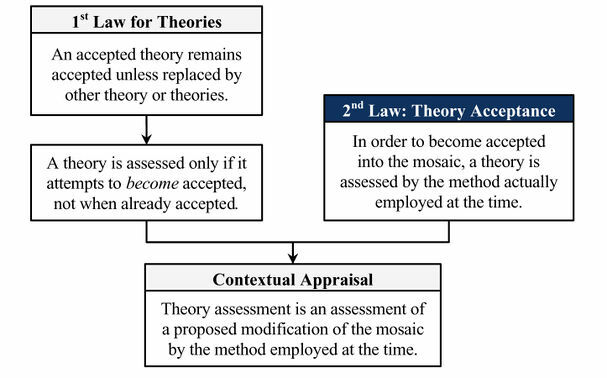 An attempt to answer the question of Nature of Appraisal which states "Theory assessment is an assessment of a proposed modification of the mosaic by the method employed at the time." Contextual Appraisal theorem was formulated by Hakob Barseghyan in 2015.1 It is currently accepted by Scientonomy community as the best available theory on the subject. Contextual Appraisal theorem (Barseghyan-2015) is an attempt to answer the following question: What is the nature of theory appraisal? Does actual theory assessment concern an individual theory taken in isolation from other theories? See Nature of Appraisal for more details. Theory assessment is an assessment of a proposed modification of the scientific mosaic by the method employed at the time. By the first law, a theory already in the mosaic is no longer appraised. By the second law, it is only assessed when it first enters the mosaic1pp. 185-196. ^ ↑ Longino, Helen. (1990) Science as Social Knowledge: Values and Objectivity in Scientific Inquiry. Princeton University Press. This page was last modified on 20 February 2018, at 02:45.